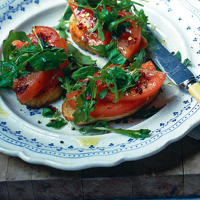 Frying the bread instead of toasting it makes this hearty, Tuscan-style bruschetta especially good - and with a topping this virtuous, you can afford a little naughtiness with what goes underneath. Lightly season the slices of tomato with sea salt and black pepper. Pour the olive oil to a depth of about 5mm into a frying pan large enough to hold all four slices of bread, or fry the bread in batches. Fry the bread until golden on both sides. Drain briefly on kitchen paper, then arrange on a plate, topping each piece with a basil leaf and 2 tomato slices. Toss the rocket in just enough olive oil (extra virgin if you have it) to coat all the leaves so that they are glossy, and finish with the dried chilli and a little sea salt. Divide between the bruschetta.